Electrical power measurement is a key for innovation. The portable Yokogawa CW500 power meter provides an accurate measurement of both consumption and power quality of any power line. The navigation screen allows the user to edit the settings quickly and easily to suit their needs. There are also keys which turn on desired measuring screens at the push of a button for ease of use in the field. Users can access the CW500's stored data easily using the included PC software. Simultaneously measures 3 CH Voltage input, 4 CH current clamp probe input, 2 CH DCV input. Instantaneous/Average/Maximum/Minimum value list or trend graph screen of Voltage/ Current/Power/Power factor/Phase Angle/Phase Advanced Capacitance Calculation. Integration Value of Active/ Reactive/Apparent Energy is each displayed consumption and generation. Demand monitoring which displays screens of present power consumption compared to aimed demand power values. The Quick Start Guide Function supports correct wiring and setting before measuring. The Quick Start Guide Function automatically recognizes the type of current clamp probe. The Vector Display indicates Voltage and Current phase difference and values between input channels of voltage and current. The Vector Display checks whether the wiring is correct or not. The CW500 captures temporary malfunction phenomena of the power line that can cause malfunction or destruction of devices due to voltage swell, voltage dip, interruption, transient voltage over, and inrush current by using a high sampling rate of 24 µs and RUS calculation. Event data contains the type of malfunction, occurred time or occurrence finish time, measured value and waveform of voltage and current of all channels for approx. 200 ms period. Measure and display graphs and lists of up to the 50th Harmonic components of voltage, current, and power for each phase and total. Measures 1-minute flicker (Pst, 1 min), short flicker, (Pst) and long flicker (Plt). Displays voltage and current unbalance rate on 3 phase wiring. Automatically display the graphical and report data by clicking on the file on the PC display. Manage multiple settings of the unit. Measure in real-time using USB communication. Integrated power data, power quality event data, main unit setting data, and screen capture data. SD memory card, USB communication, Bluetooth communication (available for US, Canada and Japan only). 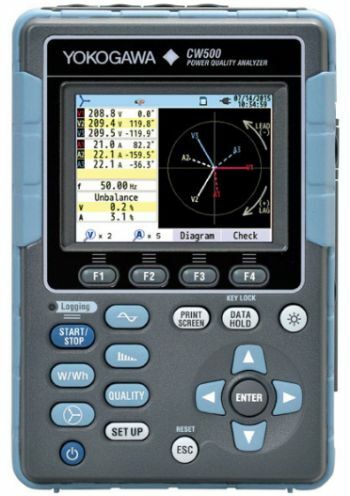 Keison Products only supply Yokogawa portable test instruments and cannot supply any other Yokogawa products. For clarification of what we supply, please see the product list.